The world is full of love that goes unspoken. It doesn’t mean that it is felt less deeply or that separation leaves a cleaner wound. Its beauty — and its pain — are in its silence. … Some of us are not blessed with revelations or confessions. Love cannot be spoken, only shown. Everything that makes the heart beat must be hushed. This excerpt comes from a show that I put on in the evenings while I work on the computer, Call The Midwives. Happy Holidays from Kaïshin on Vimeo. In remembering… a year has gone. Still healing from the 4 intense years, and then some. It’s surreal to become aware of the moment you realise that you must take on the role to be a parent to yourself, which I did as a kid at 7 years old, but also an adult, and to realise how far I’ve come. I had become my dad’s parent for the last four years of his life, celebrating the small joys, mourning the continual losses and felt the deep anguish, the entire experience left me the most vulnerable I’ve ever been (teamed with another huge life change in my personal life) and allowed me to grow in leaps and bounds. I learned just how deep unconditional love could possibly go, and just how deep the sense of anguish would feel like when I wished I could do more for him, and even for the others in his care residence, and having to accept that there was nothing more I could do, in my given capacity as a solo caregiver. I had to learn how to power process and stash things away, in order to keep going and taking decent care of myself, such as that it was ok to break down and cry. I also knew that I would somehow be forced to revisit these at a later time… when the time was right to complete the healing and growth process. The first time my dad accepted my hand to help stabilise his balance when walking. All of the emotions from then now pour out in bits, as I release them back to the earth. Grieving has been a process of finally acknowledging just how hard it was, all the feelings I felt and fought, now having the capacity and time to process it, and letting it go on a deeper level than just mentally. It made me realise that I had stopped writing after my father’s passing, and now feeling the need to write again… Thank you Vida, for your one time reminder and encouragement to me to keep writing a couple of years ago, when I stopped (dayswithfather.tumblr.com). It still stays with me now, when I start to get the inkling to do so. I have started to write again, to finally share just how hard it was, to have courage and strength to deal with one adversity in the face of another. I won’t lie, being strong is hard and sometimes a very vulnerable place to be. I have days where I simplify feel tired of being strong. Being strong doesn’t mean that I feel less or am affected less. No, in fact, I feel more than the average being a high sensing person. Being strong doesn’t mean I don’t appreciate or need offers of support and people to take care of me, it means the world to me because that it means that they care and I feel supported. I didn’t receive the support = love from my parents growing up, it wasn’t in the cards, so this was to be one of my love languages, with words, and the other by doing and by touch, I can’t tell you how much it boosts me up when I receive genuine hugs when I’m not in a place to give one. In the last couple months of his shortened life. Back to this day last year, I had one and a half days of my holidays, the day was to re-explore the old town of Prague, and then London on a layover of 9 hours. I didn’t want it to go to waste, so pushed through the sense of numbness. It was like a dream, surreal, as I made my way out of the rental apartment, and started my journey. My mind was numb, as I feel today, unable to focus very well. Looking over Old Town of Prague at dawn. The morning after having received the news of my dad’s passing, 4-5 hours of troubled sleep, I finally got up, wanting to capture the moment, melancholy numbness and stillness. The enormity of that day was sinking in but in very slow motion. I got up early in the morning after a night of terrible sleep, and while looking out the window down at the Old Town of Prague, I realised, this is the first day without having any parents left, the day that life had changed permanently outside of my control. I no longer needed to take care of my father, my mission and responsibilities had disappeared into thin air. I felt lost. 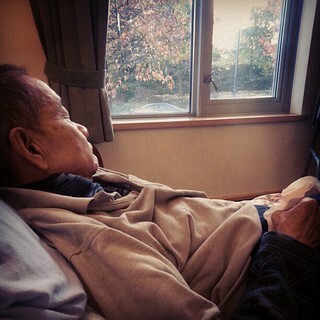 I remember the phrase my dad and I would say to each other in the moments where he could converse, 老樣子, he would reply after my asking him how he was doing, ‘same old’. I realised that today, it was no longer the ‘same old’. Dad in year one of living in a care home, having tried to trim his own hair, and having one of the good days, with some clarity… but it was also the day he asked about ending his life. Bittersweet moments. Oddly I didn’t cry that day, and it wasn’t until I on the plane ride home the early next morning, in the middle of a movie that it came, the wave of grief hit me, like a tsunami. I was caught off guard, sitting in a window seat while other seat mates were asleep, I was trapped. I sobbed as silently as I could without choking from being unable to gasp for air in a manner that would have sounded loudly, but I couldn’t stop my body from spasming from trying to hold in all that was trying to escape. I felt bad for my row of neighbours, as I was sure that my movements would wake them, despite my efforts not to made noise. After what seemed like eternity, it subsided somewhat, at least I could breathe now. I had managed to wake one of them, while the other slept through it all. I excuse myself trying not to have my tears drip all over them. I hid in the bathroom until the next wave subsided again, trying my best to look ok, and feeling more composed I made my way back to my seat. The two neighbours who disliked one another when we buckled in and showed it till mid-flight, now were looking at me with kind eyes in unison, guessing that the woman shared with the deep sleeping man her observations, sharing looks of compassion with one another and myself. I remembered how that somehow made me smile, a total Lucille Ball moment. They had not known what my story was, yet it had stopped their silliness and grumpiness, and the even somehow united them. The gentleman tried to make small talk to distract me, which was very kind, and he didn’t intrude, nor take it too long. I then found a movie that should have nothing to set me off or allow me to think, World War Z, and it had worked. I disliked it a few minutes in, then turned down the volume and eventually fell asleep, pondering on how I still don’t get the fascination with zombies. Here I am a year later. I’ve built a home, not the material sense, but the symbol of it. I’ve taken risks in taking some of this year off, in career discovery and transitions, I’ve travelled solo (forcing myself to not worry about $) many a times to allow space and time into my life so that the healing process can take place. In the many losses of the last 5 years, I have gained so much. When I think about, I get emotional and leaky eyed. The experiences outside of my control have changed me forever, I have grown leaps and bounds, happiest years in my life despite the hardships and tears. With the anniversary, I now begin grieve over the childhood years of neglect and hardship, the right time has come for me to process that now and heal. My advice to everyone, do what makes you feel any one emotion or anything that makes you feel alive. It is when you feel alive, all senses firing – fear, joy, sadness, curiosity, and many more that you FEEL the happiest, and then actually are. Don’t pursue happiness, that which cannot be done. It comes from within, you have a choice, choose to be happy and live with full authenticity and integrity, choose to have a say in what you want your life to be like every day, choose to see the positives, instead of focused on the have nots and negativity. I wish you focus with happiness. Namaste. I know many of us who crave play time outside of our jobs, a space where we can create, whether artistically or building something functional. It gives us the reminder and freedom to do so. I saw this article (link under photo), on a dual purpose and space saving table space, which seems fairly easy to construct, and is a great idea in my opinion. So why not give yourself the space and permission to play more! Try making a pop-can camping stove, work on that Arduino wearable project, or craft that handmade plushie from some scrap fabrics you saved. new dimension to his reality. now there is ‘threat’ to the lives of the Chu family apparently, we are all being targetted to be assasinated. Wow. I had no idea how to respond to this one tonight when he called me at 12:30am. I can only think that he is worried about all of us, thus this is how his mind is processing this thought. I went with this and started to guide him calmly into discussion it further with me. managed to get into a pensive state of mind with him and we concluded that there was nothing that can be done and we all die at some point anyways and if that is our fate, so be it. He was calm and agreed with “yes, that is so, I believe it also. and yes let’s discuss it further when you visit next.” I’ve found that if I let him explain and help him to express his underlying concerns through his crazy reality. Often it relates back to his concern for his loved ones, for us to be taken care of, financially, or of concerns of our well being, life and death. That is his main motive behind all the illogical stories of his reality. When I can be calm enough to step back and just be the active listener and help him feel acknowledged on this thoughts and expression, he calms down, and I discuss his reality as if it is real, but I de-emphasize it, and it works wonders. It’s hard to do, because often I believe him as is and then my brain finds it illogical and then wants to ask real questions of a fake situation. It only leads to frustration on both sides and arguments really. Acceptance while not compromising one self’s deep rooted values and needs is what makes it hard at times.